European Union Trade Commissioner Cecilia Malmstroem today defended the inclusion of investor-state dispute settlement panels in the Transatlantic Trade and Investment Partnership (TTIP), but offered several amendments for consideration. It is in the negotiation mandate, it is a mechanism in place in nine bilateral agreements of EU countries with the US (and 1400 EU trade agreements altogether), and is also a priority of the US, she said. Acknowledging that the vast majority of citizens rejected ISDS in a recent public consultation and that many members of the EU Parliament Trade Committee (INTA) object to ISDS – INTA Chair and TTIP Rapporteur Bernd Lange said there was just no need for the EU-US deal – Malmstroem offered several amendments to be considered. This includes: A permanent list of arbitrators chosen by governments should avoid conflicts of interest, jumping between ISDS and courts should be banned, and an appeal mechanism should be put in place. Also the clause to regulate and a clear statement that there is no guarantee for investors that the regulatory environment would stay unchanged should be included in the text. Malmstroem also said that in the future an international court that could hear such cases could be a viable compromise. “My staff is already working on ideas,” she said, but that would take many years. Former EU Commission Vice-President Viviane Reding recommended to consider to make the appeal mechanism an “embryonic version” of such a court. Another proposal made during the debate was not to wait for an international investment protection court to be set up, but to establish one right away in TTIP that could be opened later to other parties. The committee also held a hearing on what TTIP means for the EU citizens. 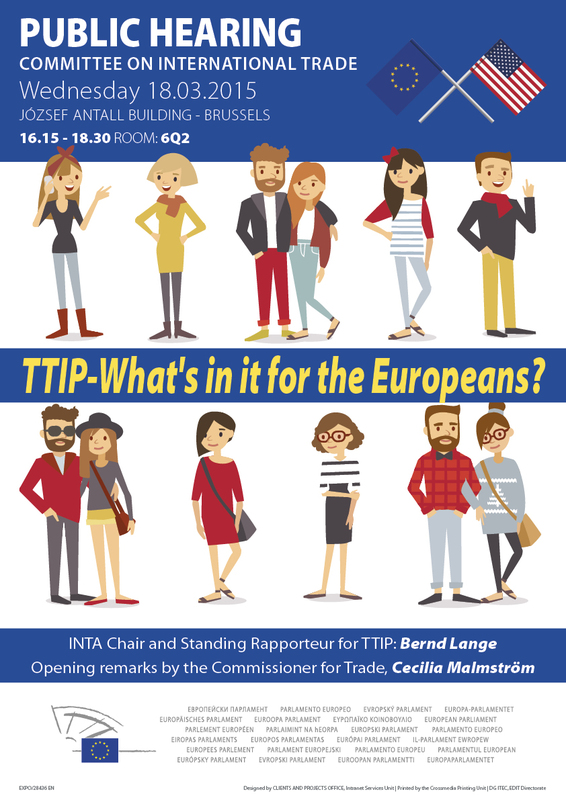 Malmstroem next week she will talk about ISDS and TTIP with the informal Council of EU Trade Commissioners meeting in Riga, Latvia. For the agenda of today’s INTA meeting, see here. "EU Trade Commissioner Suggests Special Court For ISDS Cases" by Intellectual Property Watch is licensed under a Creative Commons Attribution-NonCommercial-ShareAlike 4.0 International License.